Each day brings us closer and closer to the D-day, and we know we have the six Power Stones — persistence, perseverance, enthusiasm, creativity, devotion, and belief are in our hands (if you’ll excuse our obvious pop-culture reference here). As simple as they are, they are essential things which fuel us in working harder to develop our project. Here are a few achievements we can boast of so far. This month we implemented a multi-language function for our website. For now, you can enjoy English and Korean versions. Our Chinese language option is almost ready and more will come soon. From now on it is possible to use hardware wallets such as Digital Bitbox and Trezor to access and use the Essentia framework. This is adding another layer of security and privacy to our platform. This aside, we are constantly adding more token and currency capabilities to our wallet. Litecoin, Bitcoin Cash, and NEO are now available along with those already integrated. Now, with the ESS tokens, you can separate, and use the private key to access Myetherwallet. This is done, again, for a number of reasons. First of all, this enables you not to be tied to Essentia, so you can use Myetherwallet separately (in exchanges for instance). Secondly — security, if you lose your private key (or in any case of it stolen or compromised) you’ll lose access only to ETH, the rest of your coins will remain safe. Now if you’d like to contribute, you have to undergo a few KYC forms. We’re doing that for the benefit of us all. You can view the process as a proof of our trustability and earnestness, and we in our turn eliminate any wrongdoers, such as criminals, for example, from participating in our public sale. This month we reached another very significant milestone — Essentia is now in discussion with one more governmental institution. Last time we discussed using blockchain at border control points in the Netherlands, now we are talking about having the Essentia framework implemented to fight unemployment in Finland. This was a very exciting experience for us as we take yet another step towards blockchain technology conquering the world! On the 4th of April Essentia Founder Mirco and Matteo, attended ‘Deconomy’ in Seoul, South Korea. After the conference, we organized a free Meet & Greet, where we continued the discussion on hot topics in the crypto space. Recently we’ve posted a little photo report of the event, in case you want to dive into the atmosphere. To keep up with all the events we’re attending check the Roadshow article from time to time! 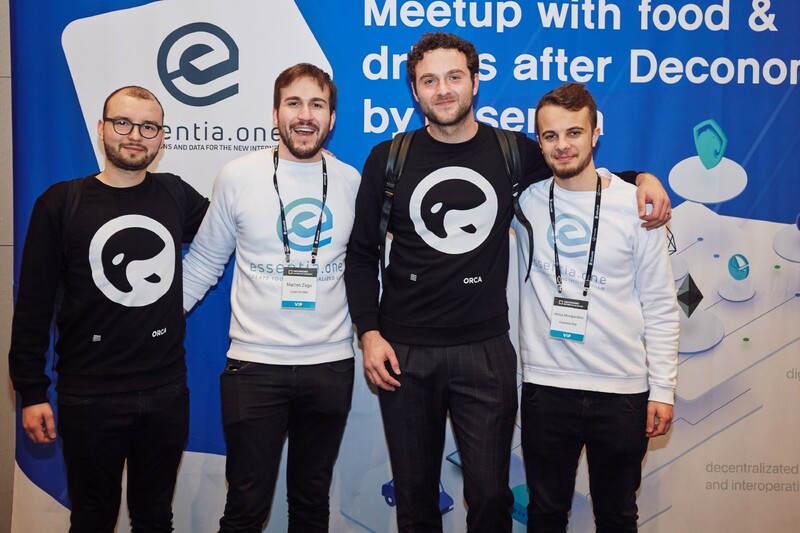 Essentia continues to work on expanding its ecosystem by partnering with projects such as ORCA — the first open banking platform for cryptocurrency users. Part of their platform will be built on top of the Essentia framework, and we are very excited about it! Learn more about the impact of partnership with ORCA here. We’re excited to announce that now you can reach one of Essentia founders Matteo Zago on Quora! The service is designed for your Q’s and our A’s, so do not hesitate to ask anything you’re interested in. For the next few months, we are planning to, first of all, implement Forkdelta instead of Etherdelta, as the latter is gradually becoming outdated. If you want to take part and influence the further growth of the Essentia ecosystem — we are only glad to give you a chance! That is why we have considered adding the voting function to our framework. Users will get to choose, from a number of dApps, which one should be added to the framework next. Applications with the most votes will be integrated into Essentia. We have the Members Area translation in progress as well, so soon our Korean community will be able to communicate in their native language. Last but not least, we are redesigning the Essentia website, all to make it more clear and easy to use, as well as to provide a more understandable description of the project. With the fast growing community and interest towards Essentia, there appear more and more scammers. Our users’ security is our top priority, so we insist you always double check the address and email you get the information from. Never send ETH to anyone as we are not in the official process just yet. If you have any doubts, you can always contact us here: ir@essentia.one. Moving to something far more positive — we are excited to announce that our pre-sale is almost finished! During the last day, we have raised $7M, and there are no plans to stop. More than 50% of our target has been reached. We genuinely believe in what we do and are infinitely glad people share our vision. Thanks for everyone who participated. Let’s create a better, decentralized and safe world together! For more information concerning presale contributions contact us via ir@essentia.one or via matteo@essentia.one. That’s it for the May updates. We hope that the report was useful for you and if you still have any questions left — ping us on Quora or any other social media channel.